What should we consider before installing a pool with a deck? A swimming pool area requires extensive design and thought. You want to consider both performance and appearance. Here are ten questions to consider when building a swimming pool deck that will provide years of genuine enjoyment. How much time and energy do you want to spend on maintenance? Consider using materials that require little maintenance. 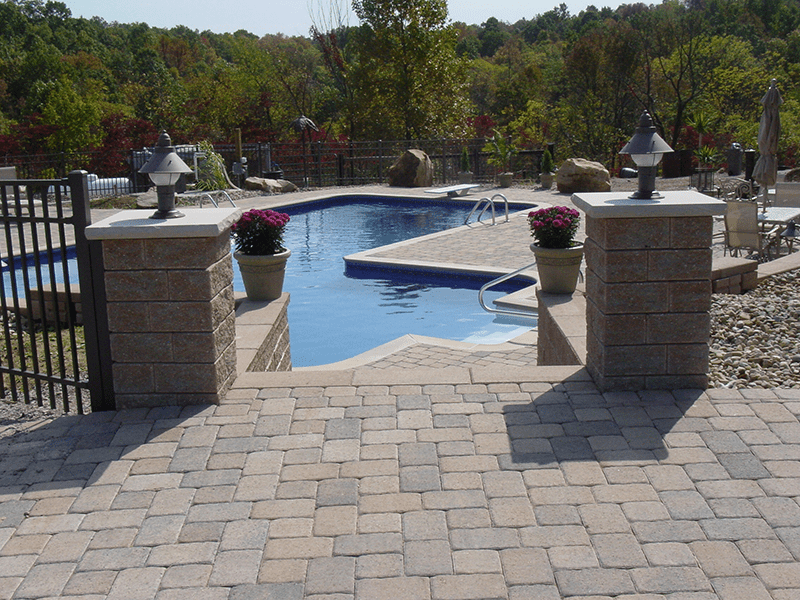 For instance, select pavers designed to prevent staining, fading and damage from time, weather and general pool usage. Think about your life. Do you have children, or will this space be used for entertaining adults? Usage considerations will impact the features, size, and materials used for your construction. Each of us has unique style preferences. Are you drawn to modern designs, or do you prefer a romantic, old world style? Eastern Sky can assist you in selecting pavers that fit your taste, anything from modern elegance to a cobblestone aesthetic that is striking and complementary to many types of architecture and tastes. Think about both your personal style as well as the existing architectural tone of your property. Who is going to do the installation? Eastern Sky offers extensive experience. Our goal is to make your project a success, not a stressful disaster. We have the bonds, licenses, and insurances necessary to take on the project, and we strive for a complete meeting of the minds concerning expectations. Have you considered other uses for the pool deck? A pool deck is often much more than just a patio. Incorporating an outdoor kitchen, overhead shade structures, and other extraneous features should be considered during the design process and be incorporated before construction begins. Remember that much of the time spent enjoying a swimming pool is spent outside of pool in the surrounding area. What will be the size and location? The size and location of your swimming pool deck depends on the amount of available space as well as the best placement for your pool. Drainage and elevation are critical factors. Consider the typical number of family members and guests who will be enjoying the area, shading during the heat of the afternoon sun, the view, and availability for privacy from the surrounding spaces. Consider the best outdoor lighting for your swimming pool area. The proper lighting can enhance the aesthetic, improve safety, and facilitate nighttime enjoyment. Lighting is much more expensive and difficult to add after the patio installation is completed. Eastern Sky can incorporate interesting features to your pool and patio area, such as waterfalls, fire tables, fire pits, or outdoor fireplaces. These features add to the project visually and aurally, and the inclusion of these aesthetic contributions can transform an outdoor space. Do you want to provide seating? Once you determine how many guests and family members are likely to enjoy the area, consider the necessary amount of seating. Whether you incorporate built-in seating walls, seat benches, or traditional patio furniture will depend on your design intentions as well as the versatility of function that you desire. Built-in seating can add a lot of extra comfort while not taking up much useable patio space. Finally, do not forget to consider the future. In years to come, plans, guests, and family members will change, so make sure that your design will stand the test of time. If you have future projects in mind, consider the scope and requirements and leave room for these within the property as you bring your swimming pool area to life.